But the government has kicked plans to ban alcohol companies from sponsoring sport into the long grass. THE CABINET AGREEMENT on implementing minimum alcohol pricing – a price below which alcohol cannot be sold – has been welcomed. Alcohol Action Ireland has broadly welcomed the government’s plan to tackle alcohol misuse in Ireland, with the Cabinet yesterday agreeing on proposals including a watershed on advertising drinks and separating displays from other products in retail outlets. 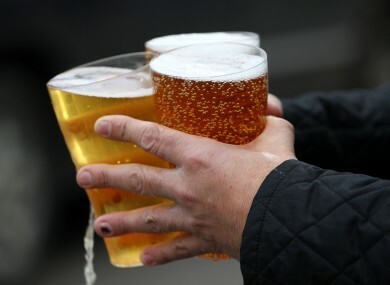 “Introducing a minimum price for alcohol in conjunction with Northern Ireland will target the very cheapest alcohol products, which are those favoured by the heaviest and most harmful drinkers among us, as well as our young people,” said Suzanne Costello, CEO of Alcohol Action Ireland. However, the proposal to ban alcohol companies’ sponsorship of sports teams and events is to be delayed until alternative sources of funding can be found, with a working group set up to consider the issue over the next year. This issue has been the subject of significant lobbying from the sports industry as well as politicians who have argued that loss of funding from drinks companies could be detrimental to sport in this country. Junior Minister Brian Hayes said last week that the coalition is keeping a “close eye” on minimum pricing being introduced in Scotland, which is currently being considered by the European Commission after five European countries argued that the policy is illegal. However, the government here now appears likely to push ahead with plans for minimum pricing in legislation that could be published as early as this week. Other proposals are likely to include a ban on alcohol ads before the 9pm watershed on television, distinct labelling with information on alcoholic strength and calories, and separating the display of alcoholic drinks from other products in supermarkets and retail outlets. Email “Government deal to implement minimum alcohol pricing welcomed ”. Feedback on “Government deal to implement minimum alcohol pricing welcomed ”.